Now that you’ve got your FFL, you’re going to need a way to manage your Acquisition and Disposition (A&D) records. What are Acquisition & Disposition (A&D) records? A&D records track all of the firearms that an FFL has received or made (acquired) and each of those firearms that the FFL has either sold, transferred, or destroyed (dispositions). Your A&D records not only show the history of your gun business, they also are what the ATF will use to conduct an inventory during an ATF compliance inspection. A&D records are also sometimes called “Bound Book” records because gun dealer records used to literally be kept in a book with bound pages. 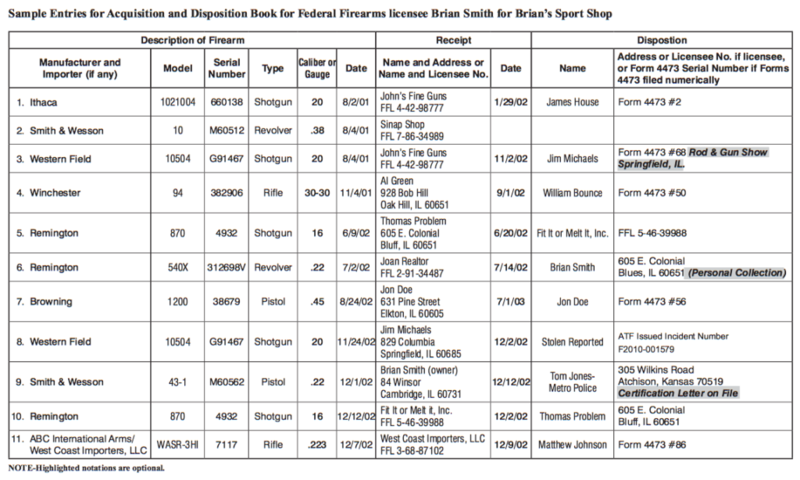 The left page of the bound book contained the FFL’s firearm acquisition information and the right page of the FFL’s bound book records listed firearm disposition information. 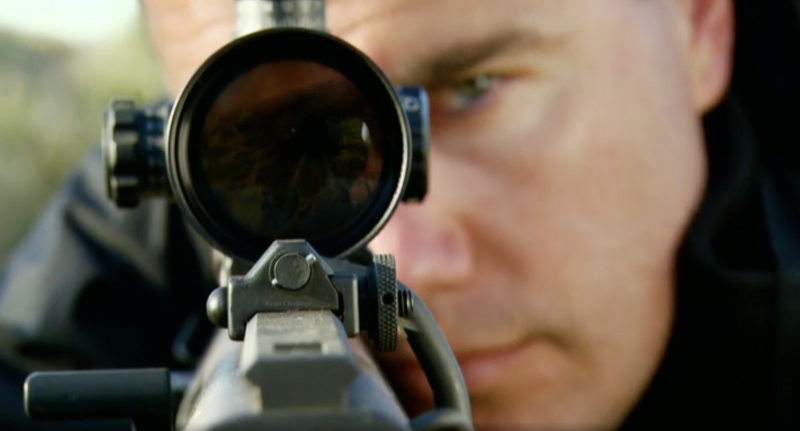 During an inspection, the ATF will ask to see all of the “open dispositions” because each of those firearm records in your bound book should correspond to a firearm in your inventory. The A&D / bound book is the heart of an FFL’s records. Yes, 4473s (for customer purchases) are very important too (most violations of the law come from these) but the core records for every FFL are the A&D records. This is because every FFL will at some point acquire, and probably dispose, at least one firearm. But, not every FFL will transfer a firearm to a non-FFL on a 4473. As we cover in our ATF Compliance training course, the ATF is concerned mainly with the traceability of firearms. This means that they need to be able to trace a firearm used in a crime from the manufacturer down through the stream of commerce (this includes you) to the end-user. When the ATF calls to trace a firearm, you will rely on your A&D records, in conjunction with a Form 4473 if you transferred to a non-FFL, to help the ATF to know where the firearm came from and where it went. If you’re reading this article, you most like already have your FFL and are looking to stay compliant with ATF rules and regulations. Let’s cover some of what’s required. 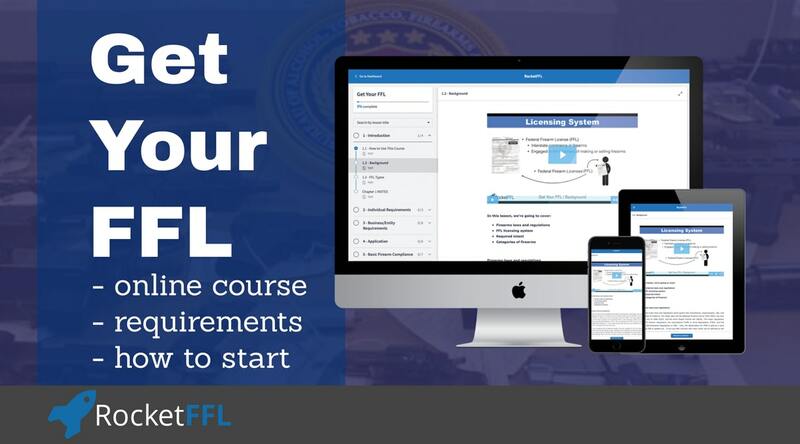 If you’d like to learn more, you really should checkout out our ATF Compliance training course. As an FFL, whether you’re a gun dealer, firearm manufacturer, or arms importer, you must acquire and dispose firearms within a certain time period and in a certain format. If you’d like an up-to-date copy of all of the firearms rules and regulations, you might want to pick up a copy of the Federal Firearms Regulations Reference Guide (free to all RocketFFL students). You must enter the information that is marked on the actual firearm. After all, that is the information that law enforcement will use to trace the firearm – they won’t have the box, the shipping invoice, nor the marketing materials. Be very careful here – the requirements for the information change if the firearm is imported. If another FFL, then the address or FFL number of the FFL. If an individual (non-FFL), then their address or 4473 file number if you file your 4473s numerically. As an example of the correct format for acquisition information with the wrong information – if you can’t spot the 7 errors in the firearms’ description information, then you really should consider taking our ATF Compliance training course. These are violations if found in your AD records. There are also time limits, depending on the type of acquisition or disposition, that your bound book entries must be made within. The date is the actual date you acquired or disposed the firearm, not the date that you made the record. If you make a correction, please ensure that you are doing it the proper way! The ATF Compliance training course is starting to sound like a better idea, isn’t it? As a firearms attorney, my clients are constantly asking me which software I recommend – they often ask me this after they’ve been using one of the available A&D software solutions and have run into troubles getting it to work properly or worse… after they just received violations from the ATF for using non-complaint software. 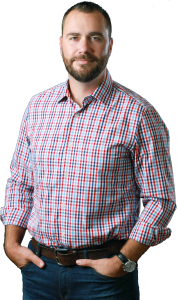 I will say this: until recently, my answer to my clients was, “No current A&D software works nor is it compliant.” I’ve since had the opportunity to work with and review some of the leading software providers and each have pros and cons. It is extremely important that you are positive that your FFL software is compliant! If you get a violation from the ATF for using non-compliant software, it is NO excuse that the software wasn’t designed by you. The ATF will not endorse particular software and you’re at the mercy of the ATF if you software doesn’t handle certain transactions properly, doesn’t backup/save the information correctly, or doesn’t output the information in an ATF approved format. The ATF has recently published some new rulings that change the standards with which your FFL software must comply. These are ATF Rulings 2016-1, 2016-2, and 2016-3. If you’re already a student of RocketFFL, you’ll automatically receive a notification whenever a new ruling is introduced and you’ll get updated information on how it affects you. Also, your access to courses is not limited, you’ll be able to return to the course to reviews information as needed and see the updated info in the course. Software can be either downloaded to your local computer or it can be used “in the cloud.” I strongly recommend the latter – cloud-based software is definitely my preferred solution. FFL Software in “the cloud” is software that exists on the software company’s servers and is accessible by you or your employees on any internet connected device. By using FFL software over the internet, you are able to view and work with your bound book even if you’re on-the-road, your power went out at your building (and you go somewhere else or use a smart phone), or the worst case scenario: a fire, theft, or natural disaster destroyed your computer! Also, when the ATF changes the rules/regs for FFL record-keeping and/or the company makes an improvement to your software, changes are usually instantaneous and you don;t have to worry about upgrading software or worry about which version of the software you’er using – you just log on and go. 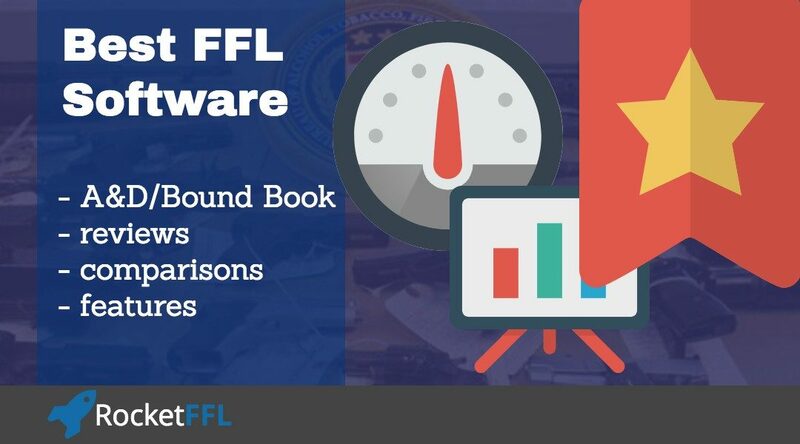 If you downloaded the software to your computer and something happens to that computer, or you are away from the computer, then you’ve just lost access to an FFL’s most vital record! Of course, you MUST keep a daily local backup of your A&D records on-site. Each of the FFL software solutions below allow you to do this. Let’s compare the three most popular “cloud-based” FFL software solutions (if you’re impatient, you can just skip down to see the winner). Each of these solutions offer in-network transfers – this means that if you transfer or acquire to/from another user, then you’ll see the information will automatically be passed along with the transfer. * FFL Boss and FastBound reviews from Facebook on 10/07/17. Epicor reviews from SoftwareAdvice.com on 10/06/17. For the reasons above, you really should not be using downloadable A&D software for your FFL. However, if you really must do it, and you don’t mind the risk, high up-front costs, or having to deal with updates, here are the most popular options compared. As a note, as the rest of the world transitions to “cloud-based” software, there’s no guarantees that these FFL software providers will be around in the future. Also, in my experiences, the customer service for cloud-based services is almost always better than for downloadable software. This might be due to the fact that the cloud-based services above are motivated to continue to keep you happy whereas once you’ve paid for and downloaded software, there’s no future benefit for some companies. * Note – none of these solutions have ratings available. Honestly, it’s hard to pick a “best” because each solution has it’s own pros and cons – you can’t really go wrong with any of the cloud-based FFL software providers. In fact, at various times, I’ve recommended different bound book software to different clients based on their needs. However, RocketFFL has partnered with and strongly endorses and recommends FFL Boss. 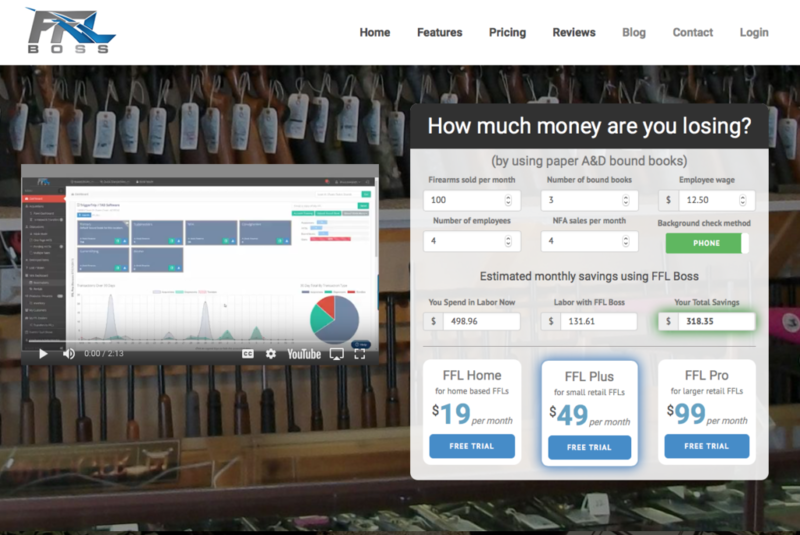 FFL Boss has amazing software AND customer service! Try it out for yourself: if you sign up for FFL Boss using the button below, you’ll get a $1 trial and watch and see what happens next. I bet you’ll receive a call from the President and he’ll work to schedule a one-on-one walk-through of how their FFL software works and show you why we think it’s the best bound book solution for your FFL.